Last week, I described a simple feed aggregator that runs periodically to generate a seed list with URLs for Nutch (with HBase backend) to crawl. Included with the URLs is a set of metadata extracted from the feed (title, summary, published date) that are also provided as name-value pairs in the seed list file. What was left was to actually generate a Lucene index out of the crawled data. Nutch 2.0 does away with the local indexer and the search subsystem and uses Solr instead, so they have a SolrIndexerJob which requires a running Solr installation. Since we currently use Nutch only as a crawler, this decision works fine for us. However, I did not have a running Solr installation last week, so I had to skip the indexing portion. the index generated is the standard Nutch index - since I need to interface the index with existing front end code, I needed a custom format. it seems a bit impractical to have to generate large indexes over HTTP - I can understand its use for pushing deltas to the index periodically, in fact this feature is one reason we are considering Solr at work. 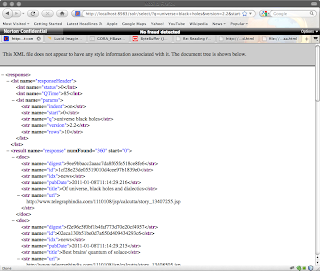 But for the initial index, my preference would be to build it locally, then scp it over to Solr. For these reasons, I decided to build my own little map-reduce job to collect the information from the HBase table and write it out to a local index. This post describes the code, and the configuration changes I needed to make. The first step was to replace some of the JAR files with the later versions required by Solr, and pull in some additional JAR files. The following JAR files were pulled from the Solr distribution into the lib subdirectory of my Nutch (Eclipse) project, and the .classpath for the Nutch project updated. Running "ant runtime" will now create a local runtime with these JAR files instead of the original ones. Basically, I copied schema.xml from the Solr examples/solr/conf directory and replaced the fields section with my own list. I decided to model the Local Indexer Job as a map-reduce program, following the lead of ParserJob and SolrIndexerJob in the Nutch codebase. I could also have built a simple HBase client that queries the WebPage table by batch-id and writes selected fields to a Lucene index. In my opinion, there is not much justification for distributing the extraction across multiple mappers, since there is almost no computation involved in this process. But I don't know enough to say which is better, so basically went with the flow. Here is the code for my Local Indexer Job. Note that I have only run this in local mode, so there may be some changes, relating to the placement of the local files, when running this on a Hadoop cluster. Also note that this code is not generic, although I think it would be relatively simple to fix, by using the schema.xml file as an input parameter to this job - I plan on doing that later, after I am more familiar with Solr code. * that can be copied over to a Solr installation. The indexer job shown above uses the MyAnalyzerUtils class below to do more custom one-off non-generic stuff. 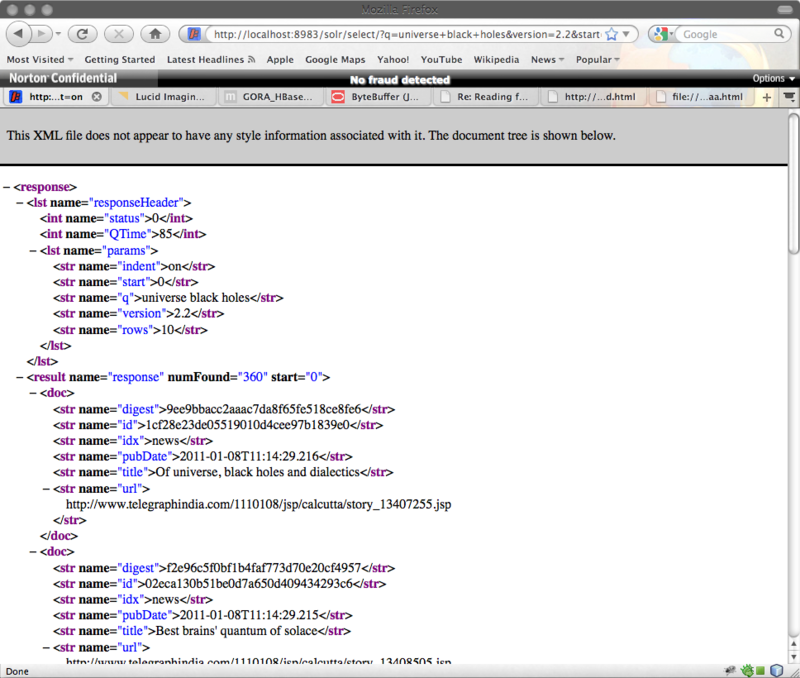 Recall that the Solr schema.xml file contains custom Analyzer chains for the fields "content" and "url". Since these analyzer chains are going to be used during query, we should use the same analyzer chains to index the data. So one of the things the code below does is to build in code the analyzer chains for "content" and "url", and wrap them in a PerFieldAnalyzerWrapper with a default of KeywordAnalyzer. The second thing it does is provide a mapping of field name to whether the field is indexable and storable. Both of these can be computed from the contents of the schema.xml file, but I did not feel like writing an XML parser, and I am almost positive that Solr already contains this functionality somewhere - once I find it, I will pass in the schema.xml file into the indexer job and replace the class below with equivalent Solr functionality. The getTextAnalyzer() and getUrlAnalyzer() in the MyAnalyzerUtils class instantiate the StopFilterFactory and EnglishPorterStemmerFactory classes, both of which require local resource files "stopwords.txt" and "protwords.txt" respectively. SolrResourceLoader looks in the conf/ subdirectory where the job is running, so I copied these files off the solr/examples/solr/conf directory of the Solr project into the runtime/local/conf directory of my Nutch project. This produces output in runtime/local/logs/hadoop.log and the index in /tmp/newsindex. 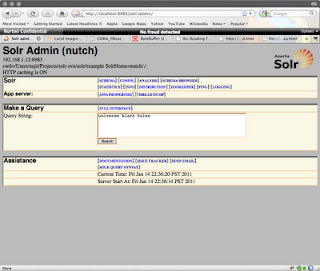 To do this, I navigated to the solr/examples subdirectory of my Solr project, then cloned the solr instance. After that I copied the freshly generated newsindex to the instance's data/index directory, and the schema.xml file to its conf directory. This starts up Solr at port 8983 on localhost, and we can navigate to the admin console on our browser at http://localhost:8983/solr/admin/. And thats pretty much it. 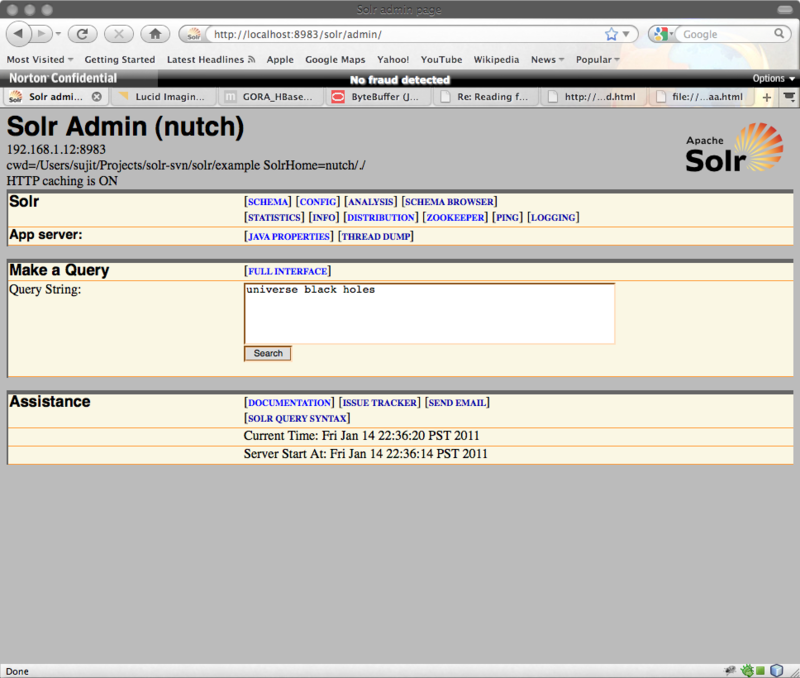 Now my feed aggregator uses Nutch as a crawler and indexer, to generate an index that will be consumed using Solr. In the process, I learned how to write a Hadoop map-reduce job that uses Nutch and GORA, and a little bit of Solr. Over the next few weeks, I plan to explore these in greater detail, and write about them if the explorations prove interesting enough. If you were writing the same feature on nutch 1.3, how would you do it? What would be the proper extension point. I think it would be a combination of Parser (or HTMLParseFilter, for extracting the metadata supplied in the fetch list), and IndexingFilter.